Nintendo’s latest heavy hitter for the Nintendo Switch finally landed this past Friday and it easily stands shoulder to shoulder with The Legend of Zelda: Breath of the Wild. In fact, I’d call Super Mario Odyssey the Breath of the Wild for the Super Mario series. 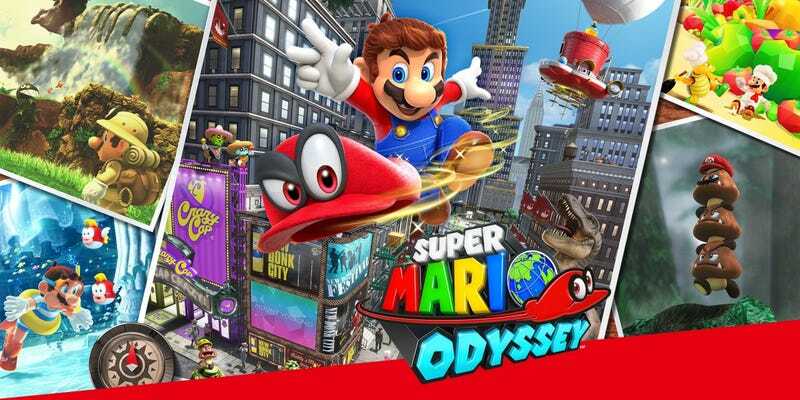 Nintendo seems to have this goal of reinventing their major franchises while retaining core elements to keep them familiar, and they’ve succeeded at that with Odyssey, though perhaps to a somewhat lesser extent than Breath of the Wild. Super Mario games have never been known for their narrative complexity. Princess Peach has been kidnapped by Bowser and Mario sets off to rescue her. That’s the plot to a good chunk of the Super Mario games and that’s no different here. The catch this time around is that Bowser is serious about marrying Peach and to that end he’s traveling from kingdom to kingdom stealing items for his grand wedding. And this is where Odyssey’s surprising narrative forms. In his quest to acquire items for his wedding, Bowser also kidnapped Tiara from the Cap Kingdom. After being outsmarted by Boweser, Mario falls into the Cap Kingdom and meets Cappy, Tiara’s older brother. Together they set out on a globetrotting journey to rescue Peach and Tiara. What makes this stand out from previous games is that there’s more voice acting than before. While Zelda had all the major characters except Link actually speak, Super Mario mostly reserves it for Peach. Bowser does speak, but it’s unintelligible without subtitles. Same goes for Cappy and a few other characters. Peach’s dialogue mostly comes down to short sentences or single words and Mario’s vocabulary has expanded a tiny bit as well. It seems like they wanted to go farther, but reined it in compared to Zelda. However, the added spoken dialogue and the more cinematic presentation of the cutscenes served to better immerse me in the game. It’s the small touches that count and it really felt like Nintendo was making somewhat of an effort to upgrade Mario’s storytelling. The only complaint I have about the narrative honestly is that the story of each kingdom is pretty repetitive. Bowser and his henchmen, the Broodals, arrive and steal a valuable item that is essential to Bowser’s wedding. Nine times out of ten Bowser is not there, but Mario fights off the Broodals, collects power moons, and then flies off to the next kingdom to do the same thing over again. If you stick around in a kingdom after defeating the Broodals, a second quest will pop up allowing to restore peace to that kingdom completely. Those quests often serve as better endings to each kingdoms story than just fighting the Broodals for the 10th time and I wonder why they went with disposable henchmen rather than Bowser’s children who have been featured in previous games and basically served the same role. There are a total of 4 Broodal siblings and you will fight each of them at least 2 or 3 times throughout the course of the story. And fighting them over and over again is not the most repetitive part. No, that honor goes to their battles. Each Broodal has a gimmick of some kind, and each time you fight them they just crank that gimmick up to eleven. Once you beat them once, beating them a second and third time isn’t particularly difficult. The one-off secondary bosses offer more challenge than the Broodals. Now, moving on to the sound design and artistry. Nintendo honestly spared no expense yet again in these departments. There’s a sound for everything and the soundtrack is good. Of course, most of the music from the kingdoms is likely to be forgotten except for Bowser’s Kingdom which is actually pretty good. The real highlight is the main theme for the game which is sung by Pauline, a character that hasn’t appeared in a Mario game for some time. It’s the first vocal song in the Mario series and it’s just oh so good and catchy. After spending a good... 15 hours or so with Super Mario Odyssey, I can safely it was worth the $60 and is definitely one of Nintendo’s greatest games. Now, 15 hours may sound short, but that’s only how long it took me to get through the main story. Unlike Breath of the Wild where you’re dropped into a world and left to your own devices, losing hours upon hours of time to the game without even touching the narrative, Odyssey moves you from kingdom to kingdom using the narrative. If you follow it and only collect enough power moons to move on, you’ll get through the story in roughly the amount of time it took me. Unless you’re a speedrunner. Then apparently it’s more like 80 minutes. Regardless, you can always go back to previous kingdoms and continue collecting power moons and collectibles even after the credits have rolled. The game sets your free with a few new things popping up and the promise that there’s something waiting for you at the 999 power moon line. I highly recommend this game to pretty much everybody that owns a Switch and I’d say it’s a good reason to pick up a Switch this holiday season. Nintendo is bringing their A game this time around and it’s certainly paying off.